Make your growing kid comfortable and happy by choosing the right style of diaper. 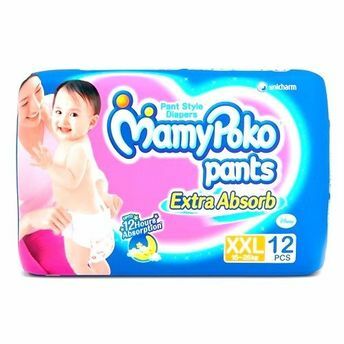 MamyPoko Pants now comes with new Extra Absorb feature that provides increased absorption for up to 12 hours and gives your baby a peaceful night sleep so that he wakes up smiling in the morning. With Pant Style, your kid can easily walk and run around, without facing any kind of hesitation while wearing diaper. Absorbancy of 6 glasses provides undisturbed sleep to your child! Many kids require special comfort and care during their growing years. With MamyPoko Pants XL size, let your child's precious sleep be undisturbed and comfortable. All-round elastic wide band: It is easy to fit, gentle on skin and its breathable material keeps the baby fresh and comfortable. Maxi-absorbent core: Quickly absorbs upto 6 glasses and gives your baby long lasting dryness. Soft leg gathers: Fits comfortably and prevents leakage. Now let your child wake up to happier mornings!